With the announcement that Interstellar’s Jonathan Nolan is developing Isaac Asimov’s Foundation into a potential series for HBO, I was discussing with friends about how we seem to be in the middle of a genuine science fiction TV renaissance. Amazingly, the network by far leading the pack right now is Syfy, which seems bound and determined to not only turn over a new leaf, but to replant the entire forest. The first vanguard of that renewed commitment to actually making science fiction is their upcoming six-part mini-series Ascension, which is set to premiere December 15. One thing you might not know about Ascension is that noted astrophysicist/SF author David Brin served as a consultant on the show, and he discusses the real science behind Ascension’s science fiction in a new featurette you can watch below. Honestly, learning about some of the real history and research that inspired Ascension has only made me more interested in the show, regardless of how much of that reality is reflected in the finished produce. I dunno, maybe I’m just a sucker for a Freeman Dyson name-drop. It’s also cool to see that the folks behind Ascension have given some real thought to what a sustainable society aboard a “generation ship” would have to be like. It’s a touch of “hard SF” that seems to be common to many of Syfy’s recently announced projects, including The Expanse, Old Man’s War, and a pair of miniseries based on Sir Arthur C. Clarke’s Childhood’s End and 3001: The Final Odyssey. Like I’ve said before, all of these projects could still turn out to be disasters, but I grow more confident in Syfy’s change of direction with each new promising announcement. Syfy also released a new teaser for the show. The trailer gives you quick snippets of the core cast. You’ve got Brian Van Holt (Cougar Town) as Captain William Denninger, a heroic sort who rose through the ranks to inherit the big seat. Battlestar Galactica veteran Tricia Helfer plays Viondra Derringer, his manipulative wife. Gil Bellows (Ally McBeal), the dude who delivers the “Ascension is a lifeboat” speech, is playing Harris Enzmann, the son of the Ascension mission’s founder. He looks to still be back on Earth, so it’ll be interesting to see how his story ties in to that of the Ascension itself, which is presumably several light years away at this point. 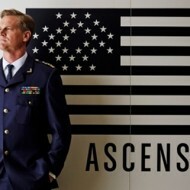 Ascension will air its six episode run from December 15 – 17 on Syfy, two episodes per night. 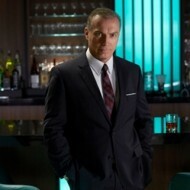 You can check out some cast photos below.